One thing that I believe is essential to a nicely decorated living space is the perfect window treatment. I've been into many rooms that have had nice furniture, luxurious flooring, and interesting artwork but then had absolutely no window treatments, just plain run of the mill, cheap white blinds. There are also many different colors and shades of blinds, but why only use blinds when there's so much more out there to use? My absolute favorite window treatment, hands down, are sliding window panels. They are very elegant and classy looking. These panels look fantastic on very tall windows. I like these a lot better than vertical blinds because the panels don't gap, or get stuck. They slide very easily on their track. Another reason that I love these sliding panels is because of their versatility. They naturally darken the room if the right kind are purchased. For me, personally, it can be very hard to sleep if it is during the day with the sun shining through the windows. With the darker colored sliding panels, the sun will be filtered out for a nice mellowed out lighting. They also come in so many different fabrics and materials. They can be bought in bamboo for a more sturdy panel. They can also be purchased in bright, childlike colors for childrens' rooms, light pastels for nurseries, or more neutral colors for bedrooms or other living spaces. 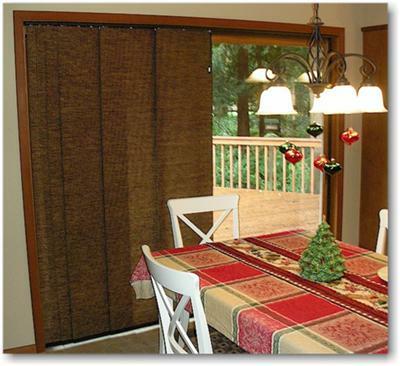 Sliding window panels go with any kind of decor, and are easy to find at home decorating stores.